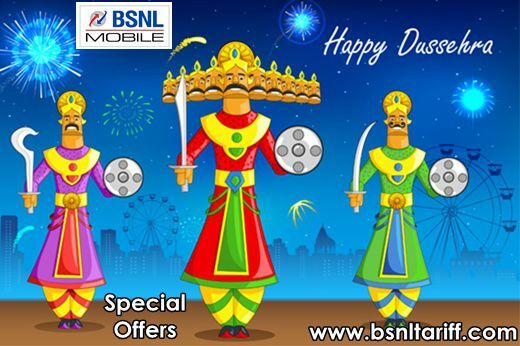 BSNL on occasion of upcoming major festivals announced Special bonanza offer on account of Dussehra for Prepaid plans customers in all Telecom Circles. State runs Telecom Company Bharat Sanchar Nigam Limited (BSNL) announces special bonaza Extra Talk Time offer on account of upcoming festival Dussehra for GSM prepaid mobile customers on PAN India basis. On promotional basis BSNL announced this offer for period of 3 days and available for prepaid users for 3 days in the month of October, 2015 under GSM Mobile services. During this festival period, this Dussehra special bonaza Extra Talk Time offer is available for prepaid users on recharge of higher denomination of Rs.890 customer will be added Rs.1000 talk time to their account i.e Extra talk time of Topup value Rs.110 may get to customer. The above Extra Talk Time limited period promotional offer will be implemented with effect in the month of October, 2015 based on Telecom Circles technical feasibility and availability before/on/after Dussehra festival 2015 in all Telecom Circles.